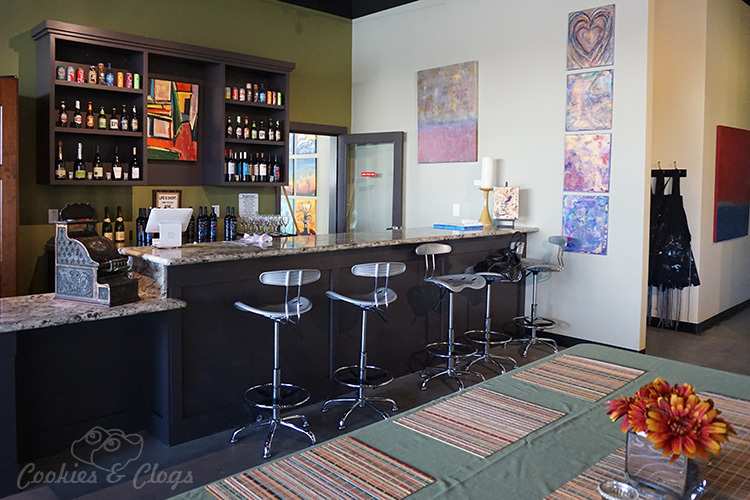 How did I not know that there is a paint and wine studio right here in San Mateo? For two years I drove by the location without even realizing what it was. In the shopping center on Norfolk Avenue, across from the Fish Market, on the opposite side of Smart & Final, and behind Specialty’s café, there is a huge art studio called Create Mix & Mingle. 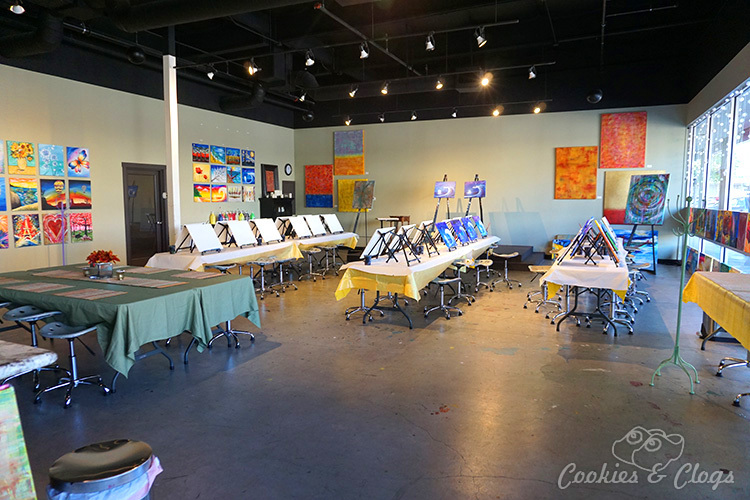 Part of the studio is set aside for children’s mixed media art classes and family painting events. The larger portion contains a wine bar and a massive space for paint and wine events. Due to California liquor laws, only adults 21 and over are allowed in that area. It fits up to 50 guests and there’s plenty of room all around. The space is relaxing and feels very open. What a find! Last week I had a Girls Night Out here. I checked the studio calendar to find an open class and one that featured a painting I liked. Then I called up the studio and let them know an approximate head count. They need at least 10-15 to hold a class so the prior notice of our group coming was necessary. Guests could register and pay by credit card online or, if they preferred, they could pay by cash, check, or credit card the night of the event. After checking in, each guest was free to visit the bar and have one glass of wine of their choice. 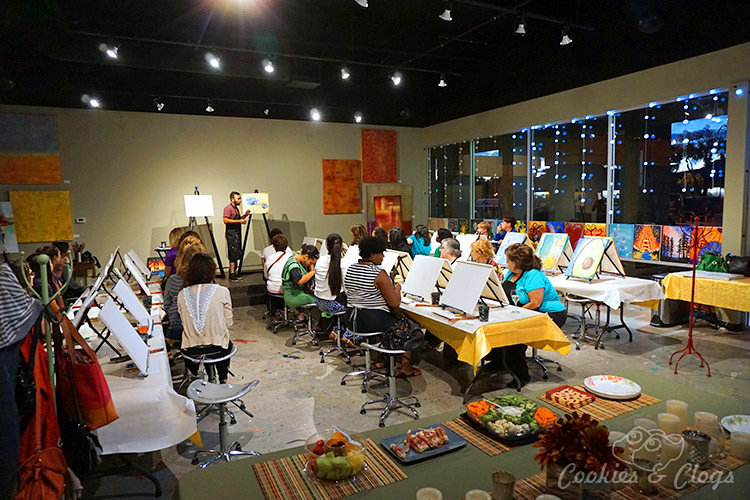 One glass of wine is (currently) included in the $45 fee for each painter. Additional wine may be purchased separately. Other drinks such as water, juice, or soft drinks are also available. Then, everyone picked up a smock and found a seat. The instructor was friendly and showed the group how to re-create the featured painting step-by-step. Every so often he would walk off the stage and help attendees with their paintings. Some needed A LOT of help and others were surprisingly good. One of my friends felt so confident in her painting that she just decided to paint something completely different. It was all good. The music selection was interesting. I had a variety of age groups with me but, since the music seemed to span the decades, each one had a few songs they recognized to sing along with and bop to. However, the wide range of musical genres prevented a lively or upbeat vibe from ever developing. The evening felt somewhat stagnant and, well, there was a strange awkwardness. Everyone enjoyed themselves though. The painting was fun but the company was better. There were plenty of laughs but also several moments of silence as people intently concentrated on their works of art. Many even purchased gift certificates to take another class or two in the near future. Create, Mix & Mingle is not a hip hotspot of young adults for after-dark fun. It is, though, a fantastic venue to spend an easy-going evening or afternoon doing something different with your friends. The studio is open for private and corporate events too. Now I just need to return with my daughter to see what events are like in the other part of the studio is like! 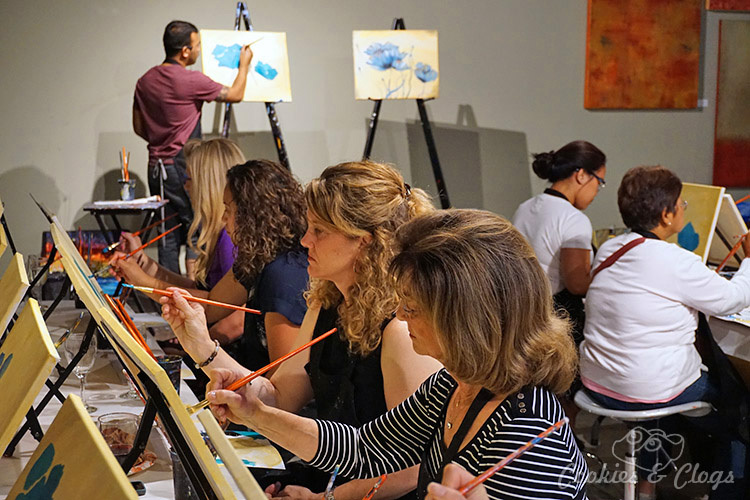 Have you participated in a paint and wine event yet? What is the Playmation Starter Pack & How Does it Work?